Happy belated Mother's Day to all moms and soon to be moms out there. As usual, I am always belated lately :) especially in updating this blog. Anyway, it was a quite Mother's Day for me. Just dinner at one of the boys favorite places. As mother, I am happy when they are happy. After all, that's what being a mother is about....of course there are other things but HAPPY is a big word for children. I am sure a lot of you would agree...yes! yes! yes!? There is a saying "We never know the love of the parent until we become parents ourselves". 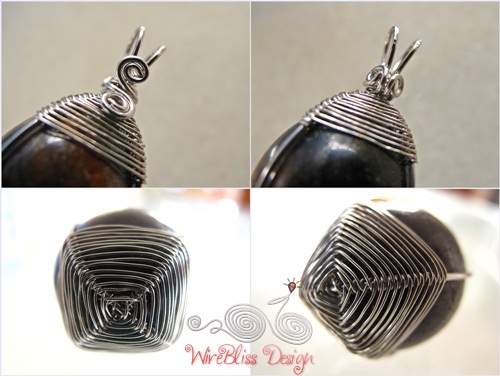 Enough rambling, here is one wire wrapped pendant I completed recently. This is a relatively big stone (name and origin not known) that looks like palm oil seed. It is rounded and has no hole so I spent some time figuring out how to wrap and secure this stone. I ended up with this "spider web wire wraps" and I am quite happy with the outcome. Here are more pictures of the pendant. Got the idea? I wonder how this wrap would work with irregularly shaped stones? Happy Mother's Day to you Mei...sounds like you had the perfect day! Wow...this is wonderful...so much detail in the wrapping. Love it! Thank you Heather, was a quite and calm day actually. Hi Val! Thank you and welcome to my blog. Hope you got lots of inspiration while visiting.